If your well has lost pressure or you notice the well pump cycling on and off frequently, this is an indicator of a failed well-pressure tank. If you learn how to install a well-pressure tank yourself, you will not need to pay for a repair man, and you will also have gained knowledge in repairing your well system. The process is fairly simple, as the pressure tank will simply be plumbed into your water main in the basement of your house. Installation typically takes less than 1 hour. 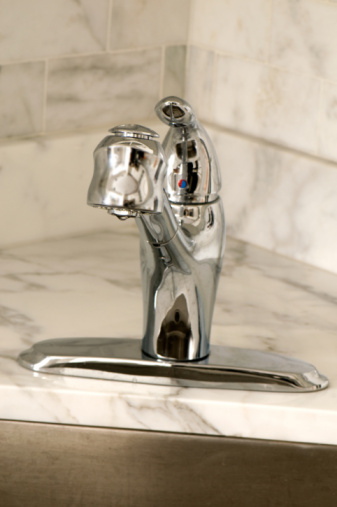 Turn off the well pump at the breaker and release pressure in the line by opening a faucet. Install the T joiner in the middle of the main water pipe in the basement after the check valve. For purposes of this article we will assume you have galvanized piping. Screw the T on with your plumber's wrench. If you have PVC or copper piping, refer to resources for additional information on how to glue or solder the fitting onto the pipe. Screw the new pipe on the top of the T joiner to go to the pressure tank. Screw on 90-degree fittings to route the plumbing to be under the pressure tank. Screw on the pipe that goes to the house on the other side of the T joiner with your plumber's wrench. Set your pressure tank in the desired location. Screw the pipe into the well pressure tank using your plumber's wrench. If needed, fill up the pressure tank with an air compressor using the air valve to the recommended pressure set by the manufacturer. Test for leaks by starting up the system.